The monster craves Fig Newtons. Yes, a monster lurks inside me. When I get upset, he bangs around just inside my left eyebrow, battering emotions, ripping giant dreams up by the roots and smashing hopes against the walls of my skull. When he tires of his rampage, he sits brooding on my optic nerve munching manhole covers wishing that they were Fig Newtons. Only Fig Newtons can soothe the savage beast in my mind and in my marriage. Why? 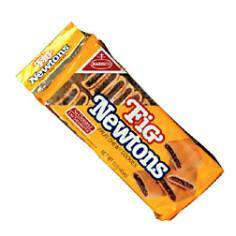 Where did this craving for Fig Newtons come from? When I was a boy, payday for my father fell on Fridays and every Friday night after my father cashed his check, he bought groceries for the coming week on his way home from work. We may have eaten beans without bacon on Thursdays, but we always knew that everything would be all right come Friday night. Daddy would come home with two big sacks of groceries and prosperity would make its weekly return. Sometimes he even managed to wrap his strong arms around three heavy bags at the same time. And carrying this enormous load of good things, he trudged the eight dusty blocks from the grocery store to bring home bringing us food and security. Dirty and sweaty from his day's work at the foundry, he would appear at the end of our street like a glorious, dusty walking cornucopia. My little brother and I watched for him and rushed to help carry the heavy bags that final block. And every Friday, sticking out the top of one of the bags, garnished with stalks of celery and cushioned by rolls of toilet paper, protruded a family-sized package of Fir Newtons. To me, Fig Newtons came to represent security. The sight of the package spelled comfort. The smell of the freshly opened cookies still envelopes me with a sense of well-being. The taste of Fig Newtons assures me that no matter what's wrong with my world, "all shall be well and all shall be well and all manner of things shall be well." Even a lingering seed stuck between my teeth tells me that I am safe and prosperous. Fig Newtons make me feel loved. Remember that when I tell you that after a few years of marriage I made a strange and shocking discovery about my young wife. At the time, we were having a rough go of things. I was out of work. The baby screamed with colic every night. Ginny's period was late. And Southern Bell had disconnected our phone. I loved my wife and wanted to do something to ease her worries and burdens. I wanted to comfort and reassure her. I took 79 cents out of our last worldly dollar and bought her a box of Fig Newtons. She stood at the kitchen sink scouring pans when I came in. "What's in the bag," she asked. "A token of my undying love, esteem and affection," I replied with a grin of self-satisfaction. "A gift calculated to bring joy into your humdrum existence. Accept my gift and I'll take you away from all this." She dried her hands with a dish towel and answered, "I'll go away with you if you'll promise that we'll never again dine by candlelight." "Why not?" I answered, "Candlelight is supposed to be so romantic." "It is. But the light bill came today, and if it isn't paid within five days..."
"Never fear, Honey. Open your present and don't worry, be happy -- at least for now," I said. She tore open the bag and the smile faded from her face. "Oh John," she said, "I can't stand Fig Newtons -- the seeds get in my teeth and drive me crazy. You didn't spend your last dollar on this, did you?" It's a terrible thing to see a monster cringe but that's what I saw when she said those words. The blasphemous thought, "she can't stand Fig Newtons" ricocheted around my brain. Like an alarmed frantic bird trapped on a screen porch, that thought fluttered past my frontal lobe and the Monster snatched it by its long neck and jerked it down. He stripped off the feathers as the bird squawked, "She rejects my Fig Newtons. She rejects my offering of love, assurance and security. She rejects me!" In bed later that night, Ginny asked me to scratch her back. But I was still angry at her and refused. Furthermore, scratching someone's back to me conjures up an image of shoddy business dealings -- you scratch my back and I'll scratch yours. Another image back scratching brings to my mind is hairy orangutans in a cage grooming each other for fleas. So we lay apart in bed in an uneasy, hostile silence while inside me my monster kept muttering, "You ought to have known it would never work out. Half all marriages end in divorce. Her family doesn't like you. You can't please everybody; hell, you can't please anybody. You can't please her. Her family..."
Suddenly, my monster pricked up his ears and leaped to his feet shouting to my brain, "Her family! Remember what you saw at her family's that day!" Indeed I remembered. It was Christmas time when we visited Ginny's parents. her father came home from a sour contract negotiation clearly upset. As soon as he walked in the door, he stripped his coat, tie and shirt, and strolled into the kitchen in his T-shirt. Ginny's mother hugged him, and as they stood there talking over the problems of the day, she kept her arms around him scratching his back. The startling revelation of this memory made me bolt upright in bed. "Ginny," I asked, "What are the things that make you feel loved?" She thought for a while and then replied in a whisper, "To have my back scratched. When I was a little girl, I saw that when either Mom or Dad was troubled, the other world scratch the troubled one's back as they talked things over. I suppose I equate having my back scratched with being loved." That's how we discovered the "fig factor" in our marriage. As Fig Newtons are to me, so back scratching is to her. We may be one flesh as the Bible says but we are different people with different tastes. The things that make me feel cared for and loved are different from the things that make her feel that way. Having her back scratched gives my wife the same sense of security and well-being that fig Newtons give me -- But I would never have guessed that if I had not asked her, "What makes you feel loved?". But answering such a question is harder than asking it. When it was Ginny's turn to ask me what made me feel loved that night in bed, I felt a great reluctance to reveal my emotional ties to Fig Newtons. It seemed such a foolish thing (a grown man hung up on Fig Newtons) and I feared ridicule even from the one person in this world whom I most love and trust. But the intimacy of her revelation called for one in return from me. So I hesitantly admitted to having such a vulnerability -- I told her how I felt about Fig Newtons. She understood all to well and started apologizing for having refused my gift of cookies just a few hours before. I too had a lot of apologizing to do for shrugging her off that evening and all the countless times she had wanted me to scratch her back. First, there are certain things, actions or expressions that convey a connotation of security and love to each person. Next, that for each of us these things are different. Then, we discovered we felt reluctant to talk about these things. Finally, we realized that the only way to learn about your beloved's "figs" is to deliberately seek it out and ask about it -- specifically to ask, "What makes you feel loved?" The more we talked, the more we realized we weren't to take blame for our insensitivities. Lovers are not mind readers. I had been hurt when Ginny refused my gift of cookies, but she had no idea of what I war really offering when I extended that bag to her. Unless I take the trouble to ask my partner, "What makes you feel loved?" how can I express love which the other person will recognize as love? Sometimes a partner will drop hints about what represents love and security to them. But their hints aren't always picked up. That's what happened to Ginny and me. There were times when it angered me that Ginny wanted her back scratched. Once I even snapped, "If you're so itchy, why don't you take a bath?" I didn't know that her itch was actually a craving for attention and love. And then, just that evening, instead of offering her her own kind of "Fig Newtons", I had offered mine. When they were rejected, I wondered how she could be so heartless as not to respond to my love. Over the years, my wife and I have found that we each have many different "figs". They vary in the degree of comfort they communicate and they change from time to time as new things develop between us.. It may be something as my taking her out to dinner or her ironing and starching my shirts the way I like them. It is through such actions as these that we say, "I love you" in a way that the other person understands. By asking your partner what it is that he or she likes, and then going all out to satisfy that need, you too can get your loving message across. Ginny and I still regard the night we discovered the "fig factor" as the second most important night of our marriage. On that night I learned to scratch her back -- and that next morning we had Fig Newtons for breakfast. I welcome your comments at John’s Blog!